Bus from Johor Bahru to Bahau is one of the most economical and effective mode of transport travel between the two cities. 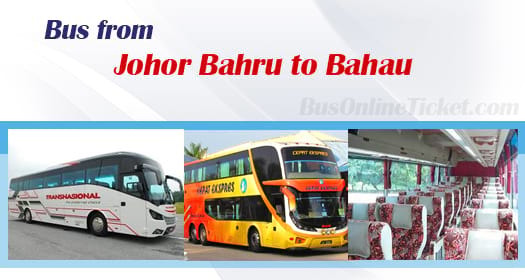 The direct bus service from Johor Bahru to Bahau offer a lot more flexible schedule as compared with train service. Trasnasional and Cepat Express are the two operators providing bus from Johor Bahru to Bahau. Cepat Express is the dominant player in this route service by having up to 5 daily trips while Transnasional offers 4 daily trips. Both players are operating the service with standard 40 seater coach. The earliest departure is in the morning 8:30am. The latest bus service is at night 8:00pm. In between, there are number of bus service running from Johor Bahru to Bahau. The average duration required from Johor Bahru to Bahau is about 4.5 hours depending on the road traffic condition. Washroom break will be given during the journey due to no toilet on board. Passenger can request for additional washroom break from the driver during the journey from Johor Bahru to Bahau. The bus ticket price from Johor Bahru to Bahau is in a range of RM 23.80 to RM 26.50 depending on your choice of bus operator. Cepat Express is offering child fare at RM 17.90. The pick-up point in Johor Bahru is located at Larkin Bus Terminal while the drop off point in Bahau is located at Bahau Bus Terminal. Book bus ticket from Johor Bahru to Bahau bus ticket with BusOnlineTicket.com now to save your precious time from buying ticket over the counter. Besides that, bus ticket is selling fast especially during weekend and peak season. Passengers are advised to book online in advance in anytime and anywhere to secure your seat.